What began as a peaceful day at home with the family, ended with a long-distance twitch. I am leaving tomorrow for the Hula Festival, so I was glad to stay at home today. It was raining so birding was impossible anyway. At 09:00 I received a call from Barak, asking if I could send out an RBA message. When he told me it's James P. Smith I instantly knew I was in trouble. 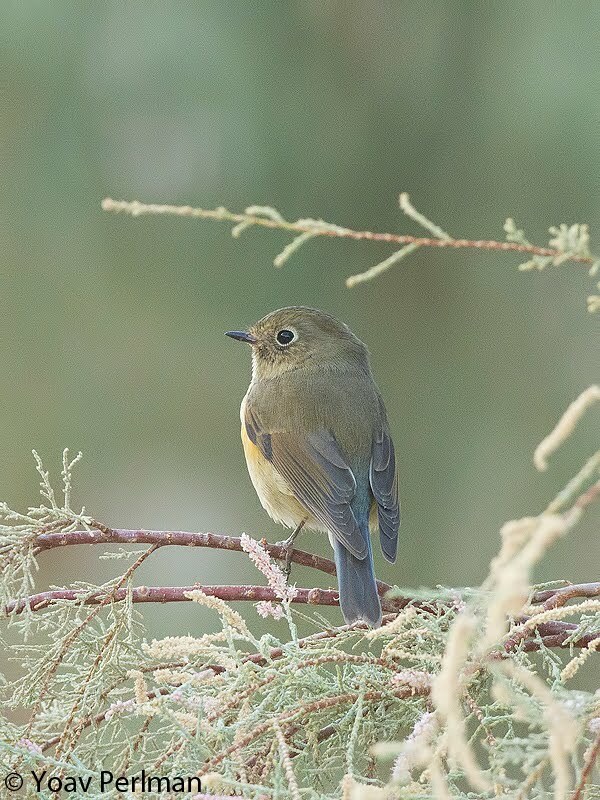 And in trouble I was indeed - Red-flanked Bluetail at Eilat, the 2nd for Israel! I saw the first for Israel in 1996, and I will be away for the whole of next week, so I decided not to go. But as the morning developed, and I heard from the first twitchers arriving at the site that the bird was very showy, I grew more and more restless. At noon I finally decided to test my wifes' love and commitment once again, and went for it. I took my elder son Uri with me for his first twitch. We picked Meidad along the way, and arrived at Eilat at 15:45, with fading light. Yotam joined us there. We got onto the bird quickly and had great views. 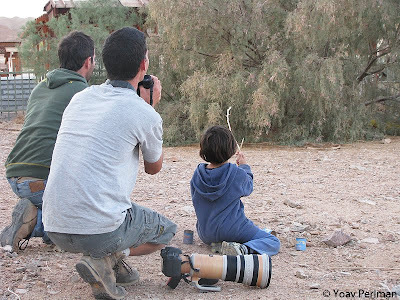 That's how twitching in Israel is - such a mega bird, and we were the only birders on site. The light was awful and the bird was feeding inside bushes most of the time, but I managed to get this decent shot. 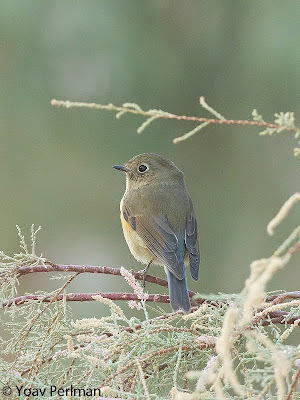 What a great little bird, and congrats to James for yet another excellent find in Israel. So tomorrow morning I'm leaving for the Hula. I am really looking forward towards the Festival. After five very successful festivals at Eilat, I am sure that our first Hula Festival will be just as good. I will be leading the visiting birders' group the whole week. We have a great program, making the best out of the Hula Valley, and visiting some of the top birding sites of northern Israel. I will try to post daily updates, so stay tuned!